Protein is an essential part of any diet, including the Mediterranean diet. While it’s primarily plant-based, you actually can (and should!) have meat on this healthy eating plan. To fully reap the benefits of the Mediterranean diet, however, you’ll need to be mindful of your choices. First, let’s talk about why protein deserves a spot on your plate. 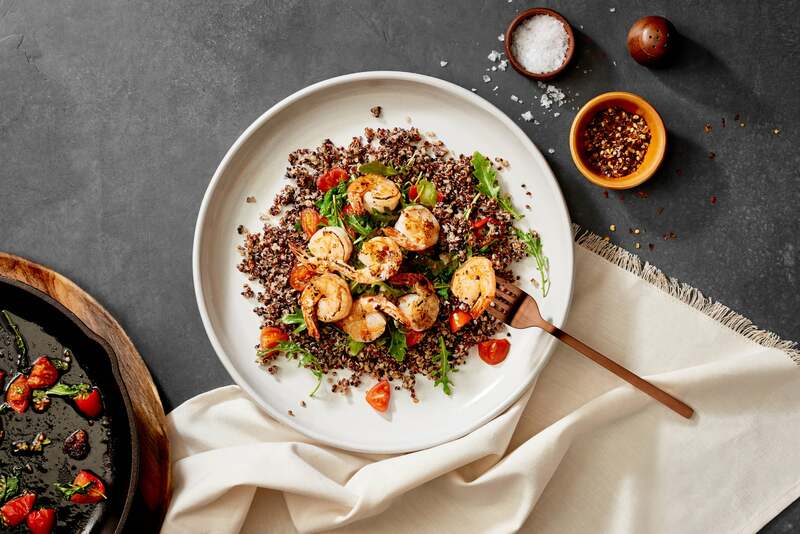 “Protein is especially important because it aids in the production of enzymes, hormones, neurotransmitters, and antibodies throughout your body,” Mary Claire Shurina, MS, RD, LD, told POPSUGAR. “It also helps with the growth and repair of cells within our hair, skin, muscles, bones, and internal organs.” Basically, protein plays a pretty important role in a lot of the things your body is doing behind the scenes. This is one reason the Mediterranean diet is linked with a lower occurrence of disease, because unlike some other diets, it emphasizes lean sources of protein. Here’s what to look for during your next shopping trip. Fish and other seafood like shrimp and scallops are probably the most common proteins on the Mediterranean diet. In addition to providing protein, some fattier varieties of fish are also healthy sources of omega-3 fatty acids. “These fats are especially beneficial for brain and heart health,” Mary Claire told POPSUGAR. When seeking out seafood, she recommends looking for salmon, sardines, mackerel, and albacore tuna to get your fill of protein and healthy fats. Poultry typically includes chicken, turkey, and duck, but can be any type of fowl you enjoy. Most poultry is relatively lean and has “low levels of saturated fat compared to red meat and pork,” Mary Claire said. On the Mediterranean diet, you want to increase consumption of unsaturated fats and limit consumption of saturated fats, so chicken breast or roast turkey can make a great addition to your meals.